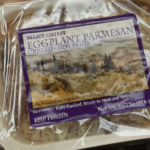 My first disappointment with a Trader Joe’s Product. The Pork Belly comes fully cooked but needs to be browned over a skillet before served. 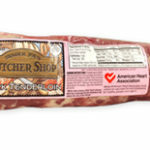 Suggestion’s to either Brown the whole loin in a skillet or slice it and brown. Seemed simple enough. But after I browned the entire loin and sliced it it was all white and mushy. It was 90% Fat. Then I sliced it and cooked it a little longer in the pan and to no avail did there appear to be much meat. We cooked it whole then sliced it and served with cubed watermelon, feta and a basalmic reduction. It was quick and delicious. The crunchy exterior of the pork belly balanced the melt in your mouth tenderness of the inside. By the way, it’s pork belly: it’s SUPPOSED to be mostly fat. If I could give it a zero rating I would. As the 1st reviewer said it was mostly fat. After slicing and seeing that I fried it to render fat. I’d say it contained maybe? 5% meat and had no particular good flavor to use the browned chunks for anything as I at least hoped for. How can people rave about eating mostly pork fat is beyond me. BTW I love pork. Uncured good bacon is a better choice than this. 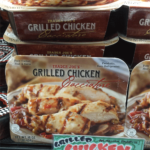 The worst product Trader Joe’s have sold to date. 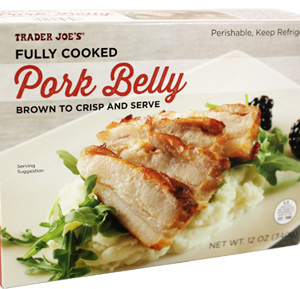 This pork belly is precooked…. meaning they boiled the s**** out of it. Nothing can save this. I tried to roast… pan cook… bake… and Lord knows what else. 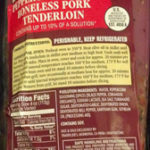 However, the pork belly is stringy and stew like texture. Totally processed. 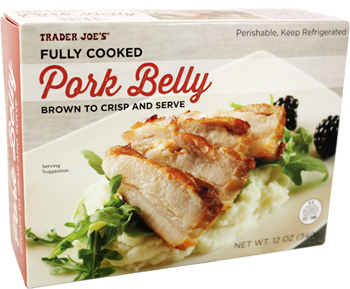 I’m very disappointed Trader Joe’s felt the need to destroy the possibilities with how their customers can cook this pork belly. 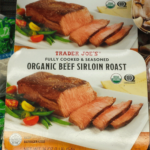 Also, it leaves a bad after taste due to the over processed ‘precooked’ preperation. Golly! Pork Belly!! it’s fat and wonderful. I slice and saute, breakfast lunch or dinner it’s delicious. 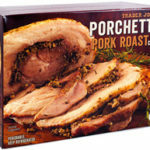 Makes me think i might never to another pork roast again.You could also cut up a bit and put into a pot of beans, with onion and cook down slowly. Awesome! I’m wondering if some negative reviews were due to undercooking. I sliced it thin (it looked like chunks of fat with a strip of at this point). I sautéed over medium heat like I would bacon. Flipped it several times until it was fully browned and most the fat had been rendered and more meat was revealed. I was left with crisp pieces that still retained just a bit of fat inside. We found it delicious.